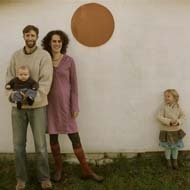 In 2003, Sarah and Sven both attended a weekend strawbale workshop. This is where they first met. This was the beginning of a love in many different ways. We are a husband and wife team. We have two beautiful children. We live in a straw bale home that we've built ourselves in Geraldine. Sarah is the designer, teacher, organizer, cook and mama. Sven, is the builder, jack-of-all-trades, teacher and father. Our intention is to live simply, be mindful, have fun and enjoy the beauty that surrounds us each day. By combining our creative and practical backgrounds, Sol Design, Ltd. was created in 2005. We celebrate the connection of craft and beauty through a sense of place and through the materials we use. By understanding the patterns of people and the space they inhabit, design solutions that meet our clients goals are achieved. We act as guides in the design process. We honor the role we play with our work and our relationships with our clients. Designing, teaching and building natural homes is our way to create buildings that inspire and support their occupants. We love to teach others but just as important, we love to learn from others. And we must not forget that we do love to have fun! Sarah, 43, is from rural Pennsylvania, USA. Her mother, a rag rug weaver and her father, an antiques dealer brought an eclectic perspective of design during her childhood. She has focused on sustainable design methods and materials, including straw bales, for the past 19 years in hopes of creating both indoor and outdoor environments that work with existing site, local and occupant conditions. She has designed and consulted on many straw bale residences in Colorado, USA and in New Zealand (since 2004). In 2000, she co-founded and was the Executive Director of the Colorado Straw Bale Association (COSBA), a non-profit promoting and educating the Colorado community in straw bale and other natural building technologies. She was a member of the Organizing Team for the International Straw Building Conference hosted by NZ in 2016. She also is a Licensed Building Practicitioner through the Department of Building & Housing. Sven, 43, was born in a family homestead on the south side of Denali in Alaska but spent his school-aged years in Canterbury, New Zealand. An outdoor instructor turned builder, Sven has a broad interest in alternatives to high-energy, conventional lifestyles. His creative approach to building concepts and ideas produce a product that is both beautiful and efficient. Sven has been building in climates which vary as widely as Alaska to Hawaii and now enjoys building his family life and creative business in South Canterbury, New Zealand. 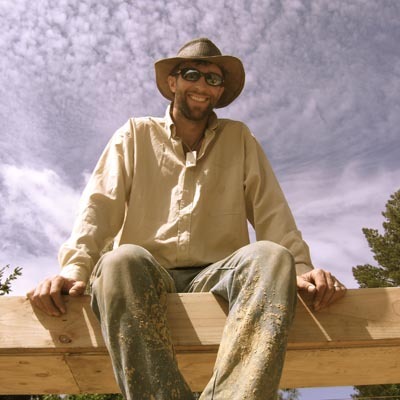 Creative is the best way to describe Sven, from vegetable fuels, to heating systems and to straw bale construction, he’s bound to have some creative solutions. As well as our design and build service, we enjoy our week long workshops, meeting like minded people and sharing what we have learnt - ultimately to grow the industry... "